November will go down in history as one of our busiest yet, as well as one of the most enjoyable. As I said in the October update we left One Arm Point and hit the road for the long slog to Adelaide where the fun would begin. 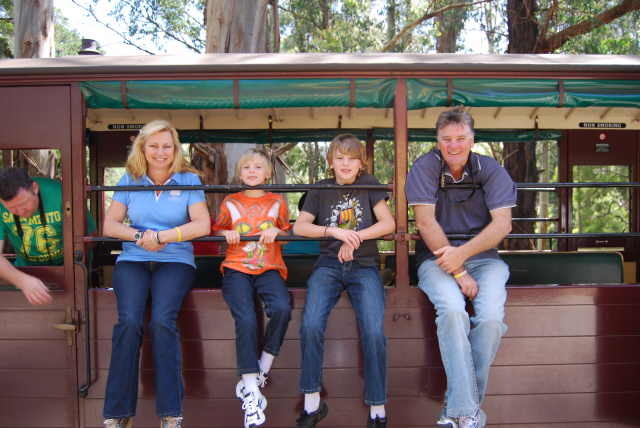 Our plan was simple - get to Adelaide as quickly as possible as we have seen all this country many times now, and then slow down the tempo and enjoy the ride. Day one had us arrive in Fitzroy Crossing and we again stayed at one of the best 'Oasis's in the Desert', The Lodge, where we had a lovely cooling swim on arrival. Next day we arrived in Kununurra late in the arvo at the beginning of a huge electrical storm. I had already decided that we would stay in a cabin if possible as the sky looked very ominous, although I did suspect it was just the build up and would amount to very little or nothing. Harry is a cabin junky and asked 50 times if we could stay in a cabin because he was sure it was going to blow and pour with rain. I told him to toughen up and that we would be fine in the tent on the trailer. The bribes got bigger and bigger. As I got out of the car at the caravan park to book in the bribe was up to 280 kisses each for Chris and myself. When I came back to the car and said we were staying in a cabin, Harry pipes up and says "We were always going to stay in the cabin, weren't we??" The look on his face was priceless. And by the way, it didn't rain at all. 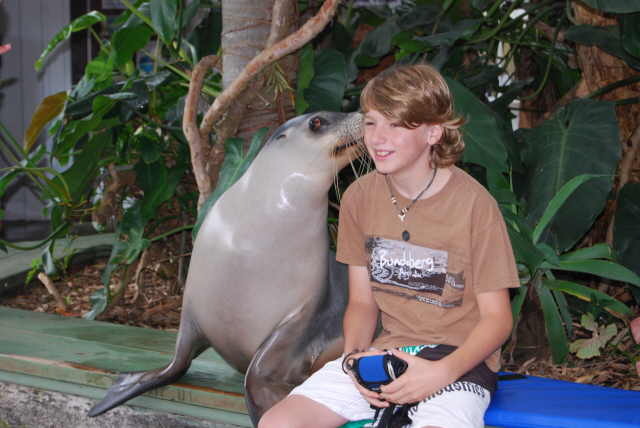 The bloody build up cost me another $100.00, but it was worth it to get all those kisses. 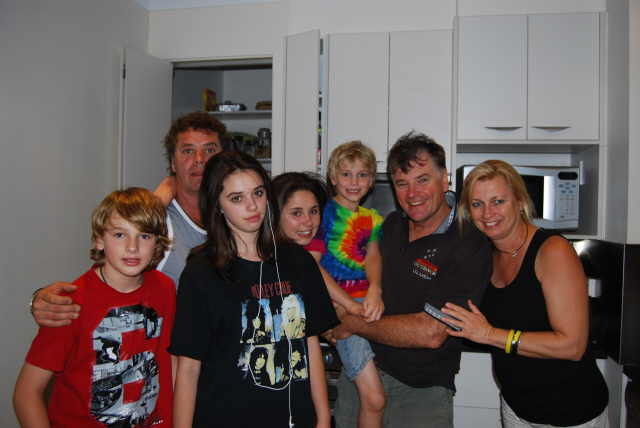 Next stop was Katherine where we stayed with Mitch, a good friend who is in the RAAF, and his girlfriend AJ. He lives on base at Tindel and we had a great night catching up. Mitch has been there for 7 years now (I think) and is about to be transferred to Newcastle. We have stayed with him a number of times now and in the future going to Katherine just won't be the same. As we stayed in the house we had a reasonable getaway the next morning and made it to Wycliffe Well for the next night. (This was Melbourne Cup Day, which we celebrated with a brief stop in at Daly Waters Pub - too early for the big race, and then a pie at a roadhouse at Elliott - minus the champagne!!) It was certainly getting hot during the days so the best place to be was in the car driving, with the nights being very pleasant. Those who have been to Wycliffe Well will appreciate how odd this place is. It supposedly has had plenty of UFO sightings and the caravan park (an expensive Big 4) really needs to been seen to be believed. Throughout the park are dozens of large statues (like really large)of everything you could imagine, including Elvis himself. Well at least I have got to the bottom of the 'True Elvis" story. It would seem he was taken by aliens!!! I am not sure why they would have wanted him, and am even more surprised they didn't send him straight back, but there you have it. I got up during the night to have a pee and water the lawn and nearly had a heart attack when I looked up and saw the big fella, glowing in the moon light watching me in action. It made me feel very uneasy. It is a bit hard to actually get your head around why anyone would go to these lengths building all these things, but I guess it worked because I am talking about it! Next was Alice Springs and we stayed in our old favourite the Diplomat Motel. We used to stay here a lot when we lived around this area last year. 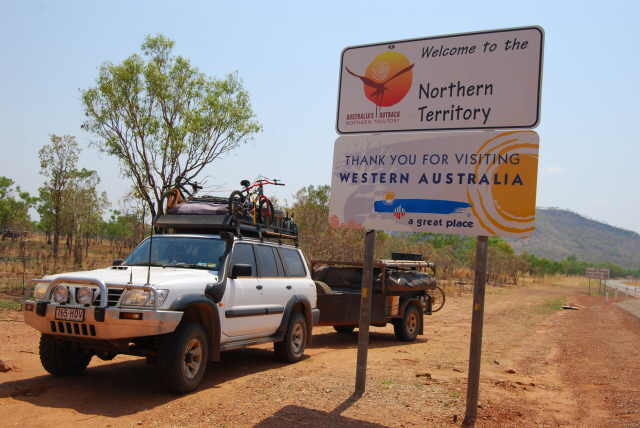 If you are ever in Alice, stay here and tell them you want NT rates. Great location in the middle of town, huge newly renovated rooms, big pool and plenty of parking, even for caravans. For what they charge I would not even consider staying in a caravan park. 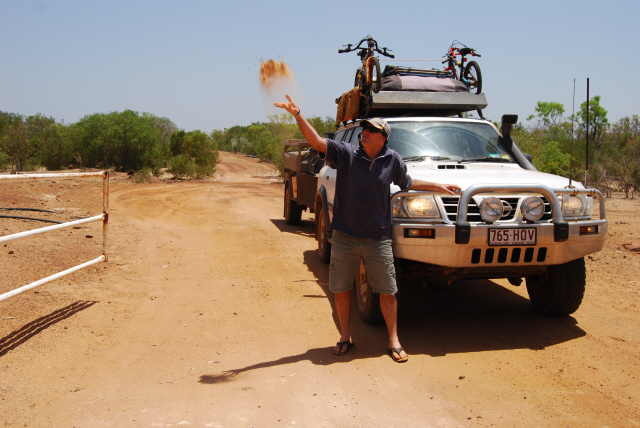 Our good friend Murph from Yulara (for those regular readers he is the OIC at the Yulara Fire Station where we often stay) was in town relieving at the Alice Station for a month. 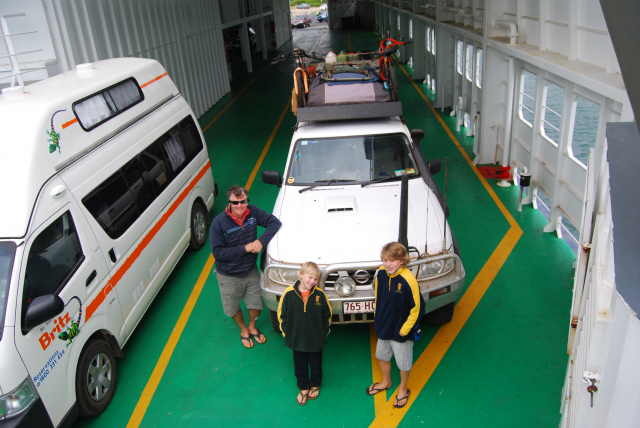 At the end of last year we left a couple of big packing boxes with Murph at Yulara to take into Alice on his next trip so they could be sent home to Bundy on the bus. Well the poor bugger took them all the way in to be told they were too heavy, so he had to take them all the way back to Yulara. They have sat out there all year, so he brought them back in with him when I said we would be coming through. We unpacked, chucked out and repacked the boxes, took them to the bus company and they were still too heavy, but they took them anyway. We all then went out to dinner and caught up on their year and especially about their recent trip to Africa and Egypt. You always miss a place when you leave it, and what we miss most about Yulara is these guys. Hopefully we will catch up with them over Christmas when they come across to see family. Next stop is one of our favorite places in Australia, Coober Pedy. By now it was getting really hot so we planned to do the cabin thing again. I know I have said this a number of times before but this place is not to be missed. It is so unique and so Australian. You will see nothing like it, anywhere. We went out to our favourite little restaurant and had a great home cooked meal at a fraction of what you would pay anywhere else. 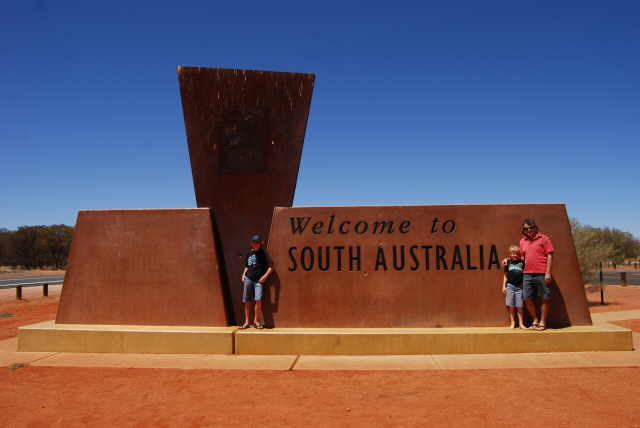 Next day, day 7 and we wanted to do the over 900km trip into Adelaide. With the driving being shared it was actually not a bad day with us arriving in Adelaide around 6-00pm. The hard slog was over, now the fun could begin. Seeing Wayne, Tracey and Bailey again was a real highlight of our trip. In 2006 on our first lap we first met these guys in Perth and then spent a fair amount of the next 6 months traveling with them. They have not changed at all and we just slipped in like we see them everyday. There is something strange about friends you make on the road, I am not sure what it is but they are special. Unfortunately it was only a short visit as we had the car booked in at Melbourne to get the chassis repaired so we were pushed for time. We saw my brother Grant and the girls for dinner one night and caught up with Brit and Greg who we first met in Bali about 15 years ago and that was it. There were so many people we wanted to see and so many things we wanted to do but time did not permit this time. As luck would have it Adelaide was having a 'heat wave' while we were there so we were happy. We hate being cold. One afternoon we did get down to the beach at Grange where Wayne and Tracey live and while it was hot the water was far too cold, with even the kids only able to tolerate it for a short time. 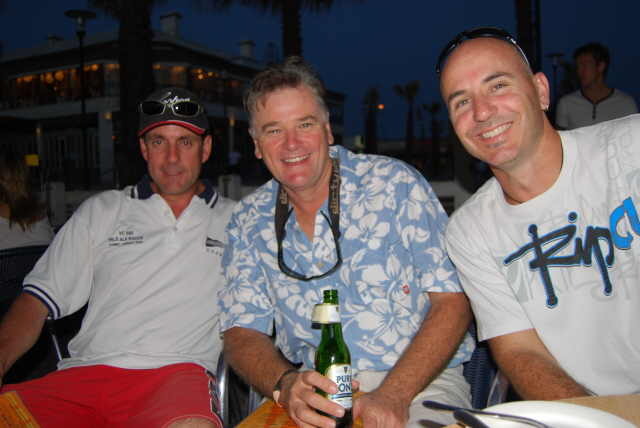 After the beach we went over to the Grange Surf Club for a few drinks. It is only a small clubhouse but does have a great view. We met some friends of Wayne and Tracey's and spent a few very enjoyable hours chatting to them. I soon discovered that Marc had been in 8 Sydney to Hobart Races including the year that a number of boats came to grief and all those people lost their lives. Talking about all his experiences was fascinating, although that life is not for me. I think I am a dry land sort of bloke. Unfortunately we had to push on with our next stop being 98 kms down the road at Tailem Bend. We stayed with Danny and Tina who we also met in 2006. Again we had a great night catching up and chatting about times had. They have a lovely spot on the Murray River and are really suffering with the long dry spell they have had over the past years. The river is markedly lower than it was last time we stayed with them. Unfortunately Tailem Bend is almost at the end of the mighty Murray so it is going to take some extremely wet weather upstream and locally before things change. 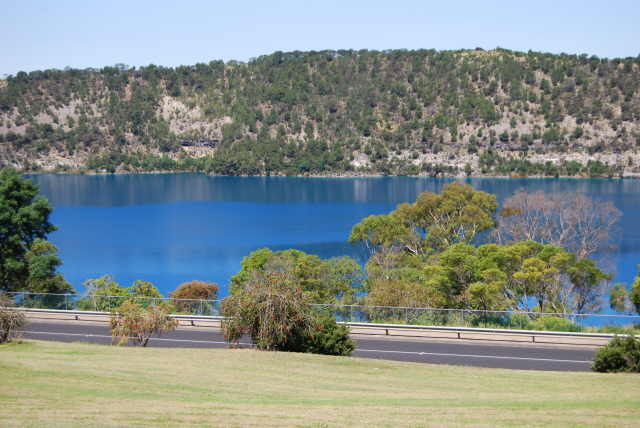 Next morning we were off passing through the lovely town of Mt Gambier. 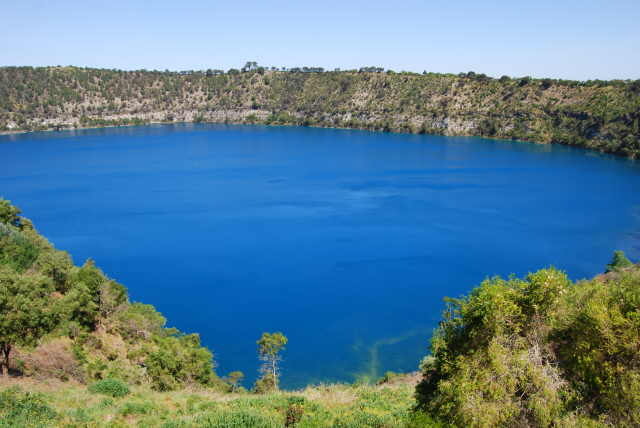 Mt Gambier is of course famous for the Blue Lake. This volcanic lake is in fact very blue and quite spectacular. There are beautifully maintained parks all around the numerous lakes in this area. 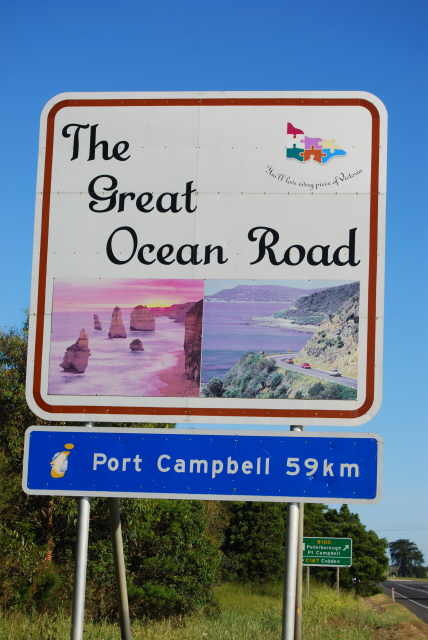 We had lunch and continued our journey and stayed the night at Peterborough which is at the beginning of the Great Ocean Road. This was something we really wanted to see and had allocated a few days so we could stop at all of the numerous vantage points along the iconic Australian stretch. Certainly in our opinion the western end is by far the most spectacular. 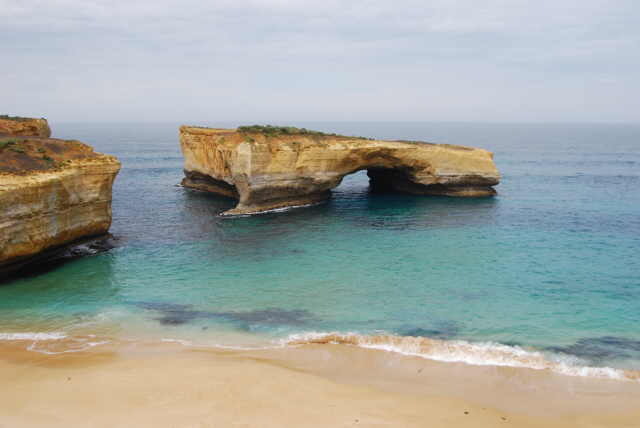 London Bridge, The Arch, Sentinel Rock and Loch Ard Gorge are by far the most interesting. 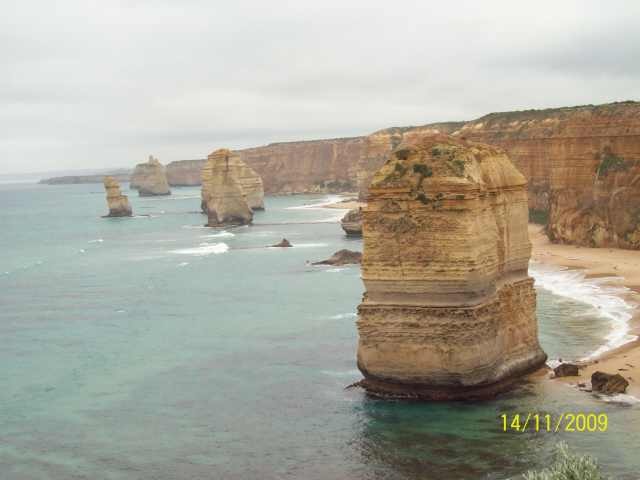 In comparison we found the 12 Apostles a little dreary and extremely overcrowded. We pulled up at the Apostles car park and there would have been 30 coaches with most of the foreigners being more interested in our car and camper than the natural attraction. As we walked back to the car Alex photographed about 20 of the international tourists taking photos of our set up. I am not sure which part fascinated them the most. Perhaps it was the fact the roof was piled up 2 metres high. 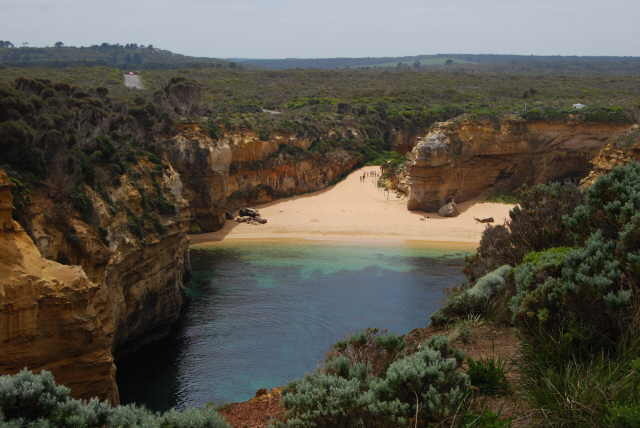 When you leave the Apostles and get to Princetown you head inland until you again join the coast at Apollo Bay. 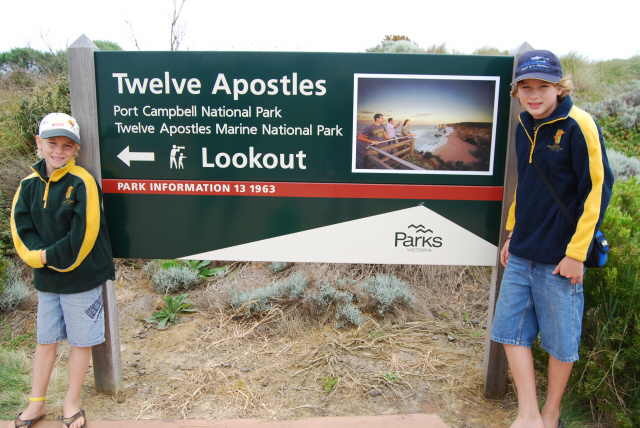 We had planned to stay in Apollo Bay that night but decided to pop in and see Cape Otway and what a great find that was. As we drove the short distance in from the Great Ocean Road we passed all these cars with people looking up into the trees. Chris thought she saw a koala so back we went. Sure enough there they were, and not just one but hundreds of them. I am not sure if I have ever seen one actually in the wild, but this certainly made up for it. Then a few kms further on we came across a caravan park. We pulled in to find large grassy sites with a very flash and ultra mod toilet block. When I was booking in the lady said the park could be a little noisy as it was the koala mating season, and boy what a noise they make. So all night we had to listen to these little hair balls ripping it off. 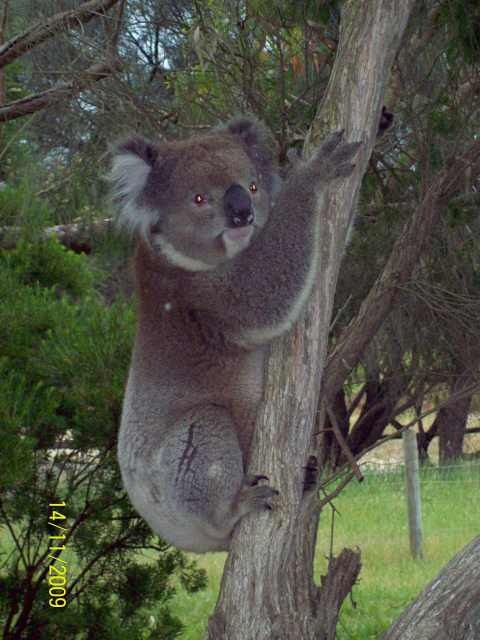 As we were setting up a koala walked straight through our camp site, climbed up a tree in front of us and sat at our shoulder height for us to photograph it, talk to it and admire it. What an experience. When he/she (not sure how to tell one from the other) had enough of being photographed, down he climbed and off he went. We then borrowed a fire tin, bought a bag of firewood and sat around the fire listening to a hundred koalas enjoying themselves. 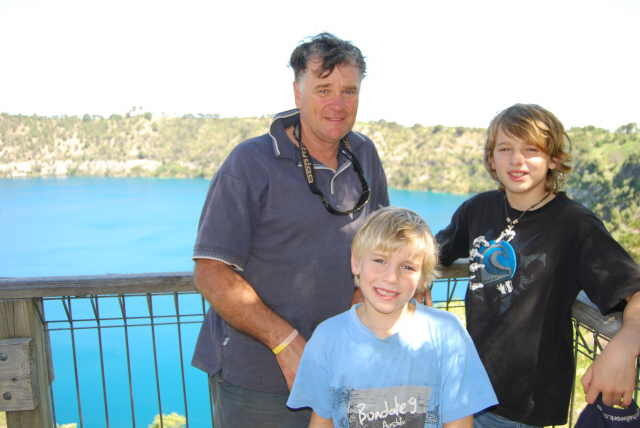 Next morning we drove the few kms to the lighthouse and looked around and climbed it. I think we have now been up nearly every significant lighthouse in this country. If you are down this way, do not drive past Cape Otway. 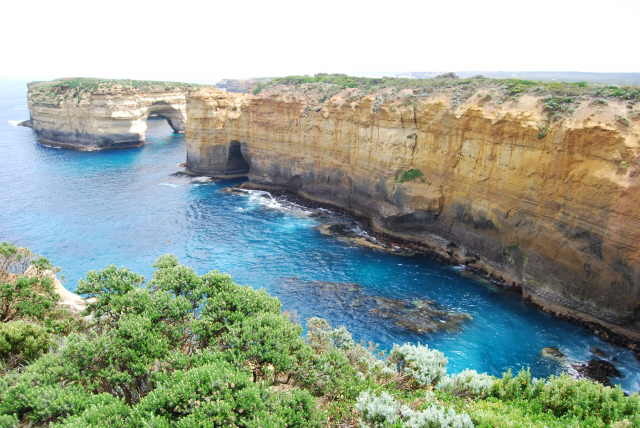 Next day we continued the Great Ocean Road, which while nice was nothing like the first section. 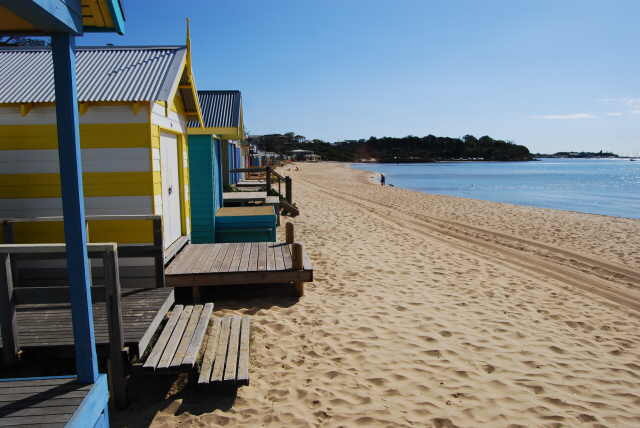 You pass through some lovely seaside towns but it is all just beach, beach and more beach. No roughed cliffs, no formations, just sand. (The Ed begs to differ - I enjoyed the lovely scenery while travelling the road that hugs the hillsides, gazing over beautiful little beaches!!) 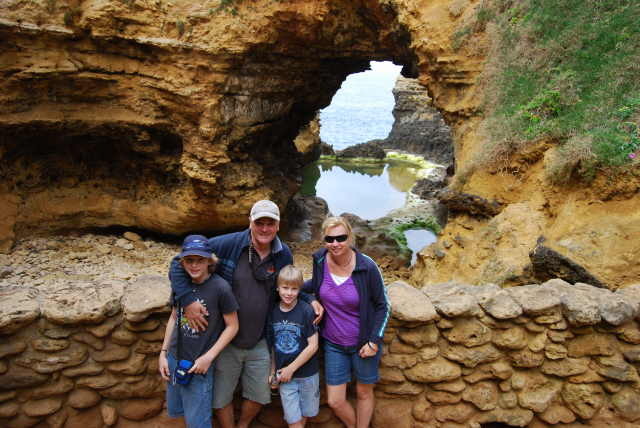 Our destination was Torquay to stay with Geoff and Eileen who were working at Kalumburu in the mission while we were there. Again we had a great night and the best pizza I have ever had from a small boutique pizza shop. 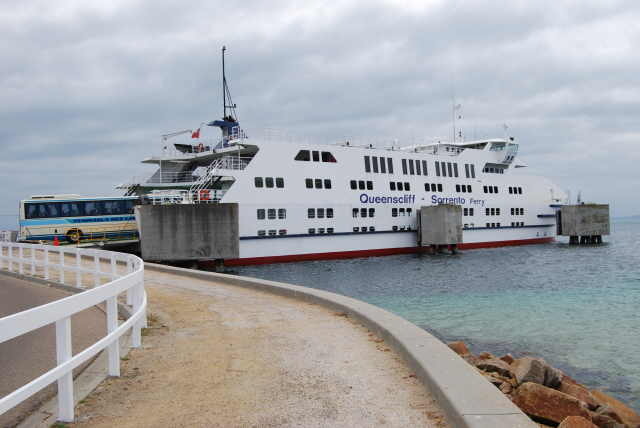 Next morning we headed to Queenscliffe to catch the vehicle ferry to Sorrento. We decided to take this route as it was a bit different and because we didn't want to tackle the city freeways as we needed to get to Dandenong to get the car's chassis repaired. The boat trip takes about 45 minutes and was very pleasant. We drove on, parked up and headed upstairs to have a coffee, cake and enjoy the view. We arrived in Belgrave South which is close to Dandenong by lunch and arranged where to stay. We stayed in a cabin in a beautifully maintained park at Chelsea Heights and hired a Nissan X-Trail. We ended up staying there 4 nights while the car was repaired. Again we had the best weather, hot and sunny. We were having such a great run with the weather that we were really able to do all the touristy things. Our first day in Melbourne we did a bit of running around getting bits and pieces for the car, did a bit of shopping and explored around Frankston and Mornington. 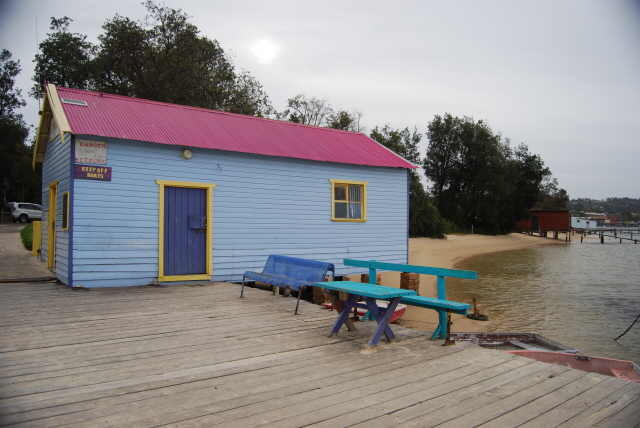 Chris loved the colourful little beach houses that sit proudly on the sand. She must have taken a photo of every one of them. Believe it or not these sell for around $150,000-00 each. Most have no power and none have water. Add to that the fact that you can not stay in them overnight, these are a very expensive single garage sized day use only shelter. It must be a social status thing, why else would you bother. 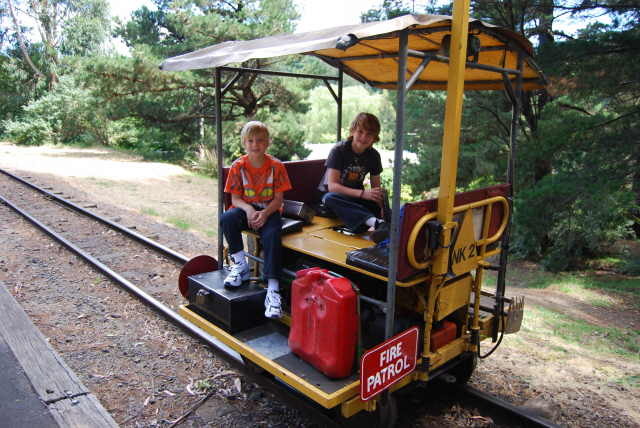 Next day we went to see the progress on the car and then took a ride on Puffing Billy. 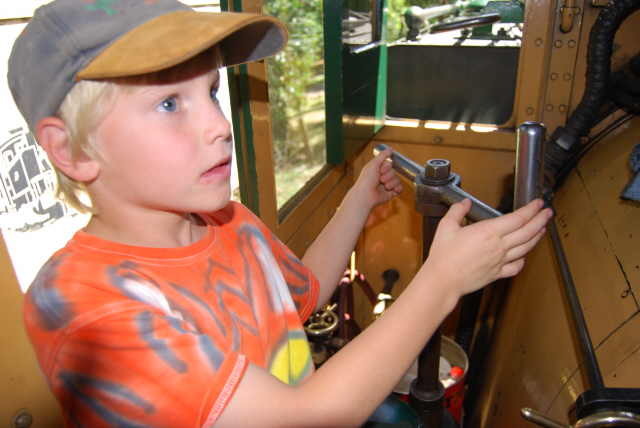 This steam train goes from Belgrave to Gembrook. This was an all day trip and very spectacular. One of the best parts and something I am amazed they let you do is sit on the window sill and hang your legs outside the train, while it is traveling along. It was a hoot and a really special time in this litigation mad world that we live in. 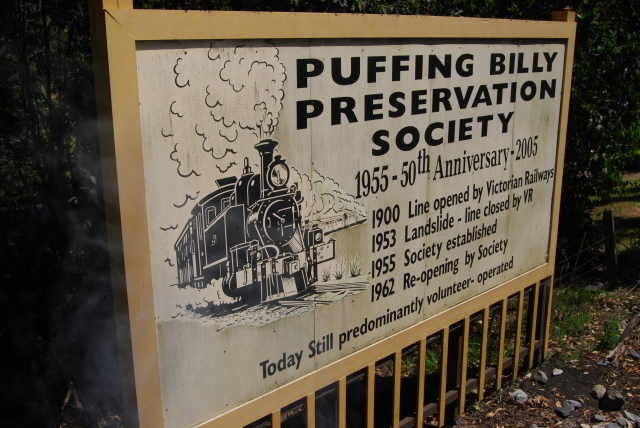 We have now done Puffing Billy, Pitchie Richie in Port Augusta, The Rattler in Gympie and the Karanda Railway in Karanda. 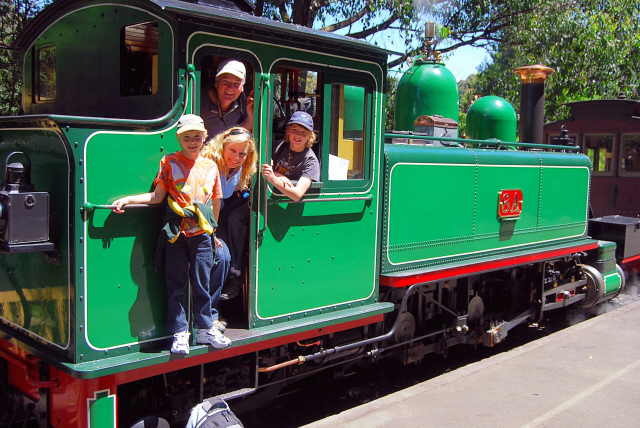 I am not aware of any other major steam train rides in Australia, except for one in Tasmania which we will have to do in the future. Next day was a bus, train and tram trip into the city. It was a hot day, in fact a 'heat wave', according to the locals. We visited Federation Square and went up Eureka Skytower which is the tallest residential tower in the Southern Hemisphere. It has an observation floor on the second highest floor which gives a great view of the city. For those thrill seekers you can do 'The Edge'. This is a clear acrylic box about 9 ft square that slides out from the side of the building. You stand there with nothing under you, on top or in front of you. The look on the punter's faces was priceless as the unit slid out and they looked down. One poor English tourist was pinned to the wall, as white as a ghost with absolute fear oozing out of every pore in her body. This is one part of her Australian holiday that I am sure she would rather forget. 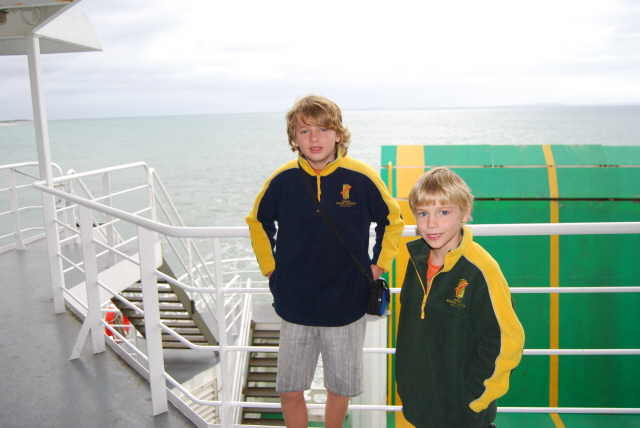 We then caught the tram down to St. Kilda which is a very pretty place. We walked the jetty and the beach, walked across to Luna Park (which was closed) and generally poked around. We have visited Melbourne twice now in the past few years and both times have had excellent weather. Maybe all these stories about Melbourne having crap weather are made up just to keep us tourists away?? Finally the car was ready, chassis fixed, new boost and EGT gauge and instrument pod installed, catch can installed and front wheel bearings repacked. It actually took us until lunchtime to repack the car, drop off the hire car and actually be on the road. For anyone out there who owns a Patrol that was built from 1989 until the present should very seriously look at getting their rear coil spring tower strengthened by this guy. For just over $600-00 he will strengthen both sides with a level of workmanship that you rarely see these days. His yard was full of Patrols waiting to be repaired, some almost brand new. If you don't want a cracked chassis, call Aaron at ATOC repairers in Belgrave South, Melbourne. Believe me it is money well spent, and could save you a lot of grief in the future. This is a significant design fault that should have been addressed by the manufacturer many years ago. All I can say is thank god for Aaron. As I said we got away late but luckily only had a short trip ahead of us, off to Lakes Entrance to stay with the Alkemades who we first met in 2006 at Streaky Bay in SA, and who we stayed with back at their home in Perth later the same year. They left the West a few years back and have bought a beautiful avocado farm just out of Lakes. They have a big house with a visitors wing (very upmarket) where we stayed luckily as it rained. We had a great night, many laughs and too many drinks. Next morning Caz took us for a drive around the area. 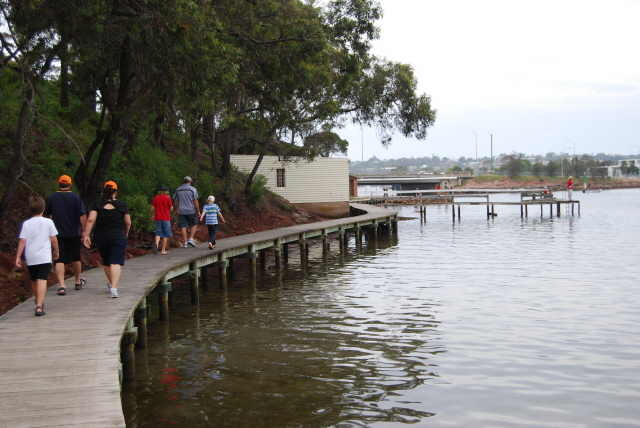 Lakes Entrance is a beautiful area with a huge expanse of waterways all around it. You could spend weeks exploring this area. 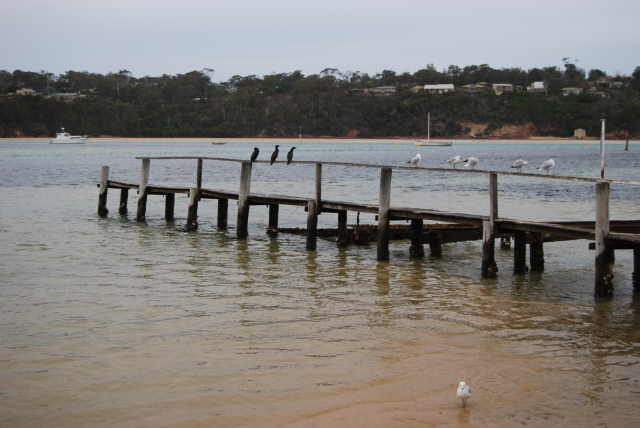 Next stop was another of our favourites, Merimbula NSW. We stayed again with Bryan and Jane and the kids. These are the guys who helped with our van chassis rebuilding in 2006 and the van re-sheeting in 2007. It was nice to be there just as a tourist. Out of all the people we met and travelled with in 2006, these are the ones we see most regularly, and we will hopefully see them next year when we do the trip to the Cape. We had a great time, plenty of laughs and it was sad to leave. Bryan always says the best part of having us visit is seeing our tail lights heading off down the street. I think he is joking!!!! 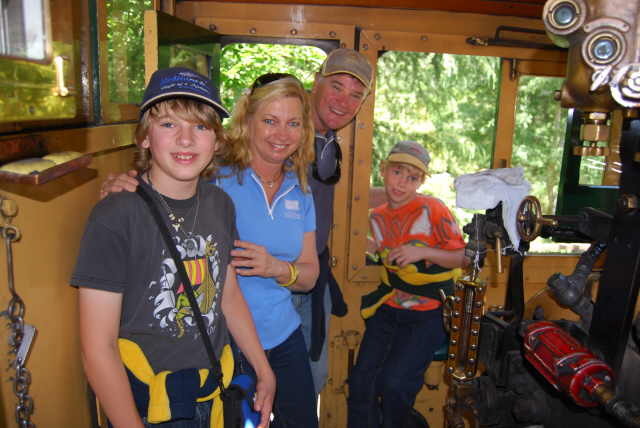 Our next stop was Sydney going via the ACT. This meant we could officially say that we have visited every mainland state and territory in Australia this year. 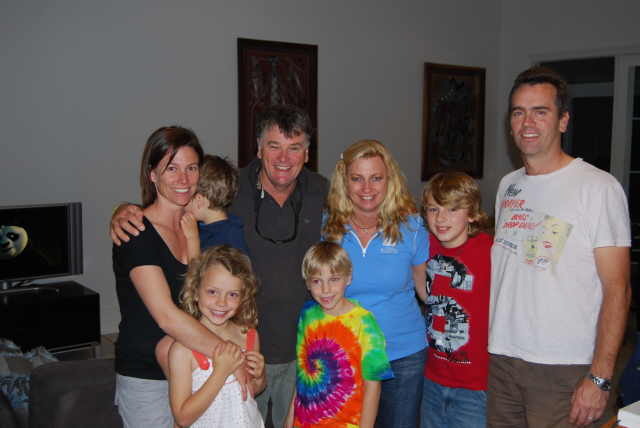 We arrived in Sydney later in the day to stay with another family we met in 2006 and who we again stayed with at their home later that year. It was great to see the Bredens again and we spent 2 nights with them. 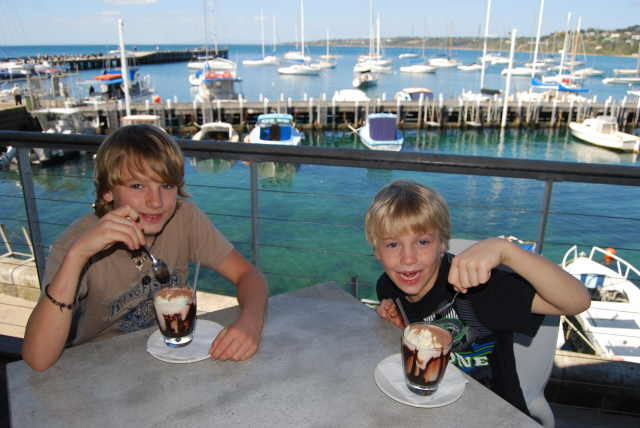 They live in a lovely area in the northern beaches. 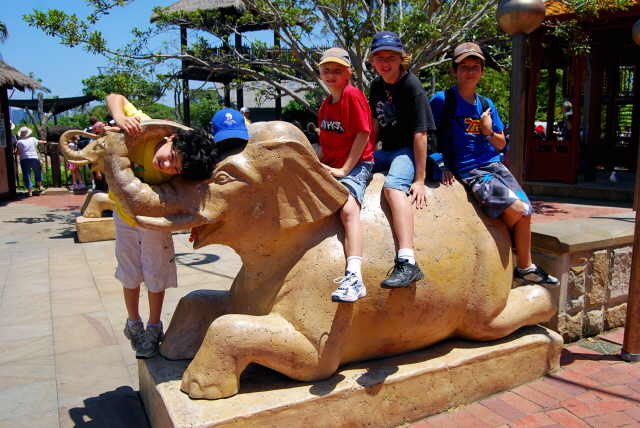 Harry really wanted to visit a zoo but Adelaide and Melbourne had been too hot. 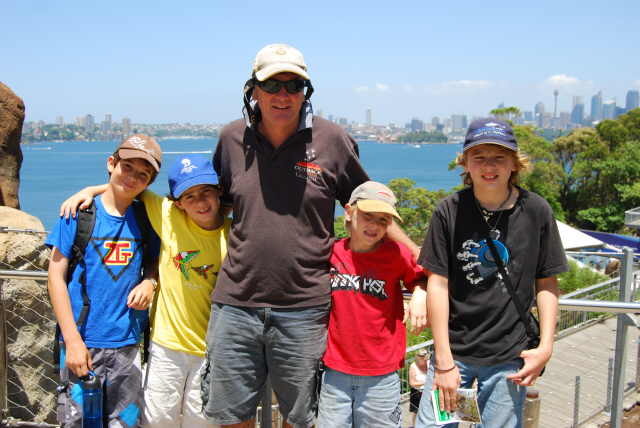 Sydney put on great tourist weather (clear skies and not too hot) so we hit Taronga Park Zoo. We took 2 of the 3 Breden kids and had a full, tiring but very good day. 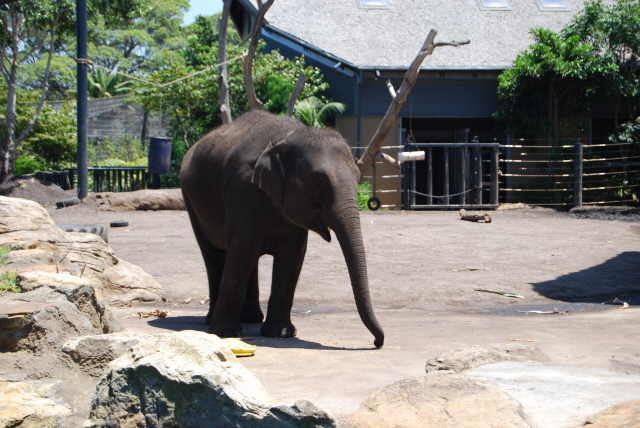 That is one spectacular zoo, with a billion dollar view, and the best part was that we nearly had the place to ourselves. The "free flight' bird show was the highlight. How they train these birds and why they just don't fly away has me staggered. It truly was outstanding. Unfortunately now we were on a bit of a time line as we wanted to be on the Gold Coast for our nephew Nic's 21st lunch in 3 days time. 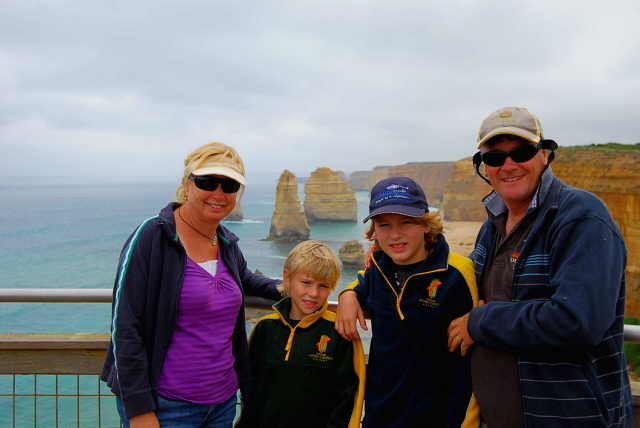 We had met a young family earlier this year in Cape Range NP, WA and they then spent a month up in Kalumburu (Marnie's parents were volunteers at the Mission) while we were there. 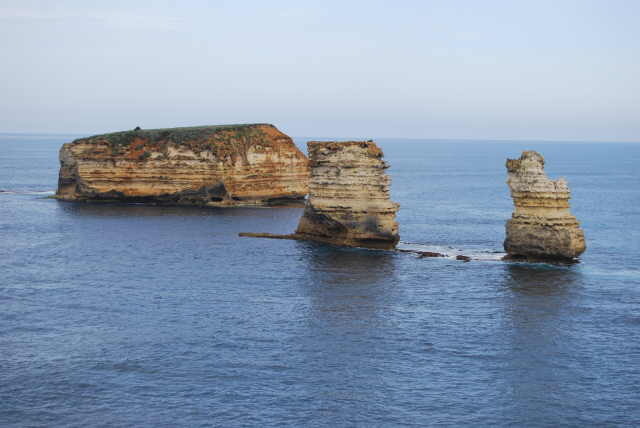 We planned to meet up somewhere on the NSW north coast as they were heading south for Christmas. We ended up catching up in Sawtell which is just south of Coffs Harbour. This is one very pretty place. 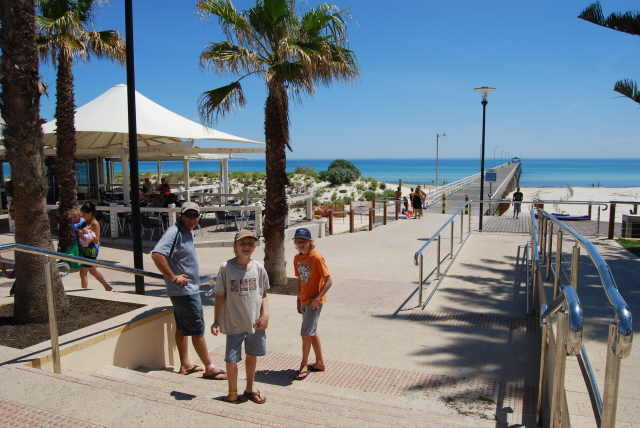 Great caravan park with the greenest grass ever, and one of the prettiest main streets we have seen, not to mention endless beaches. We spent two nights there and went out to dinner at the local pub that was owned by a couple that Jamie and Marnie had met on the road. We spent the evening comparing notes and chatting about life on the road. Jamie and Marnie are really good fun, be it a little mad and we hope to see them again in the near future. 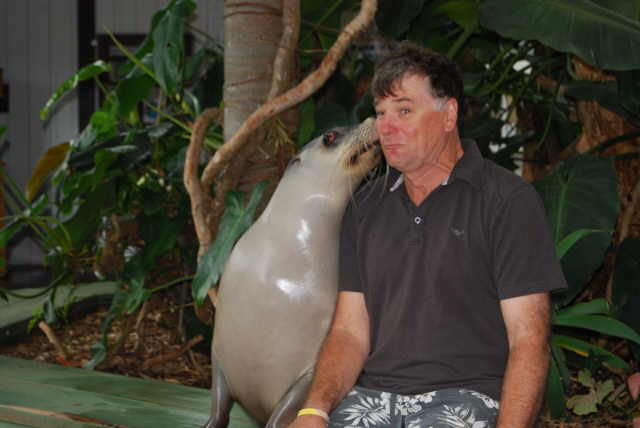 I realise I have mentioned this before but if you are ever in the Coffs area you really must get to one of the best tourist attractions in Australia. 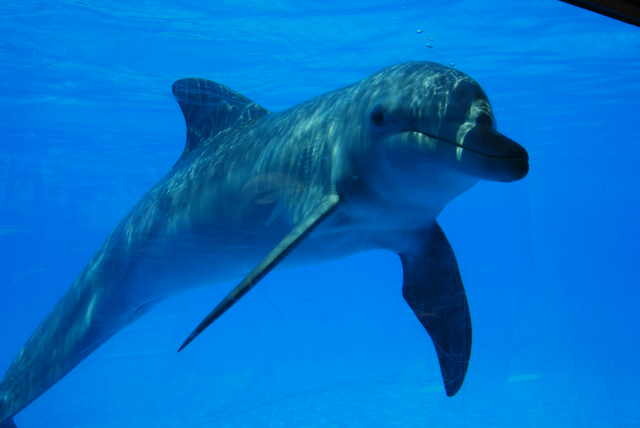 I am referring to the 'Pet Porpoise Pool'. 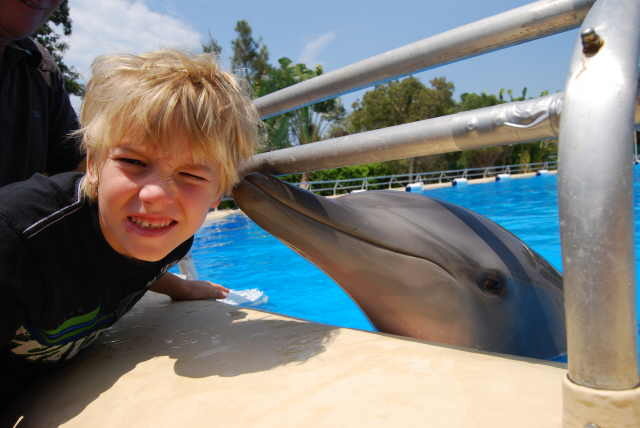 This very interactive attraction has dolphins, penguins and sea lions that you are encouraged to interact with. 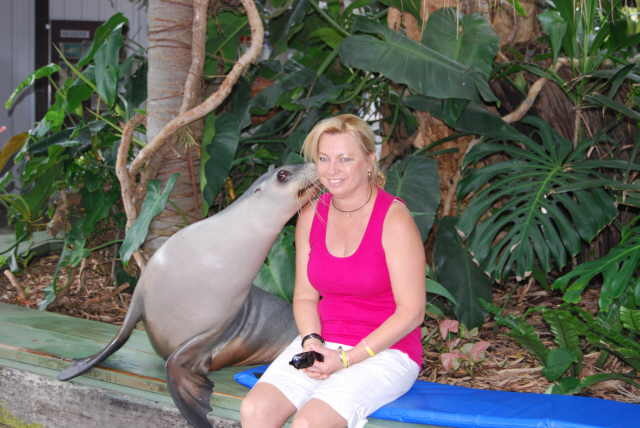 They have a few shows a day and then you just wander around playing with the wildlife. 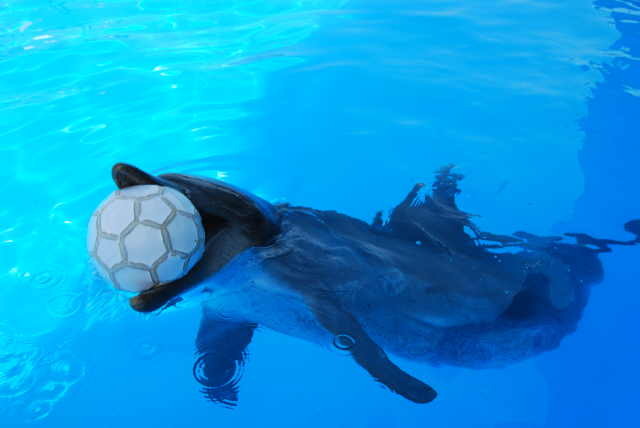 Where else can you throw a ball to a dolphin and have it throw it back to you, over and over again. You are able to participate in the training program and watch and learn how it is done. This really is a very special place. Don't miss it and do allow at least 3/4 of the day to really get the most out of it. 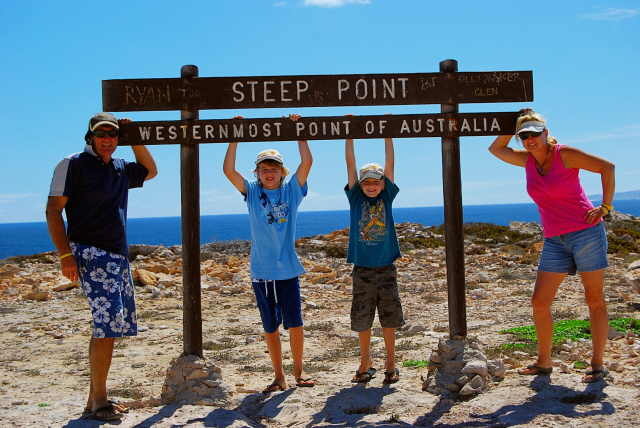 For those regular readers you would be aware that we made it to Steep Point, the most westerly point of Australia earlier this year. 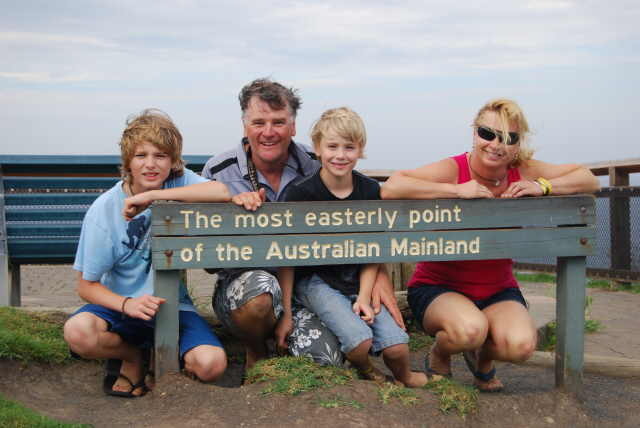 Although we have done the most easterly, Cape Byron, before, we thought we should drop in and see it again. We had planned to stay in Byron until we arrived and were confronted by 5 million schoolies. I don't think I have ever seen so many people in one small area. It was ridiculous. We decided this was not the place to stay the night so dumped the trailer in a small public carpark at the bottom of the hill and made our way up to the lighthouse, and the most Easterly Point. Unlike Steep Point, we did not have this place to ourselves. So for this year we could tick off both the most Westerly and the most Easterly. 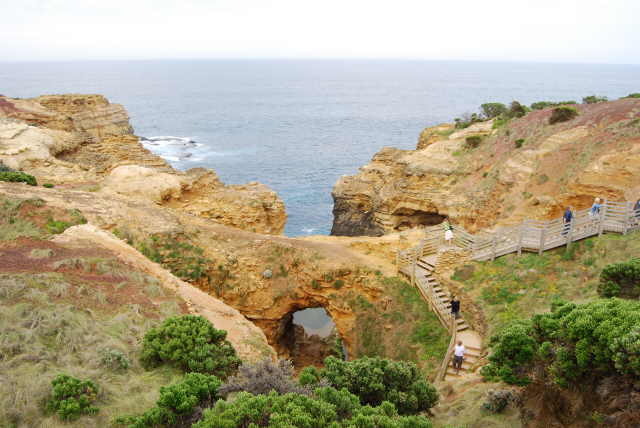 We had really wanted to get to the most Southerly point of mainland Australia (Wilson's Promitory) on our trip up from Melbourne, but unfortunately we were not really set up for the overnight walk and camp that is required to see it. We thought a 30km round trip on foot in one day might be stretching the friendship a little, not to mention our little legs. We will be buying a bit of 'hiking' type gear for Vietnam so we will be able to use that to do the trip in the future. I am not sure how, but we would really like to do this next year. May require a quick flight down to Melbourne around late November, just so we can say we have been to all four points. We were now in the death throws of our epic trip back home for Christmas. We set the silly 'Nav' shiela to get us to Springbrook, in the Gold Coast hinterland for Nic's 21st birthday lunch. What should have been a 40 minute drive ended up being nearly 3 hours. She had us hopelessly lost. Finally, mainly through good luck we arrived. Tony (our brother-in-law) lives with a mate at the very top of Springbrook. What a climb, and what a view up there. 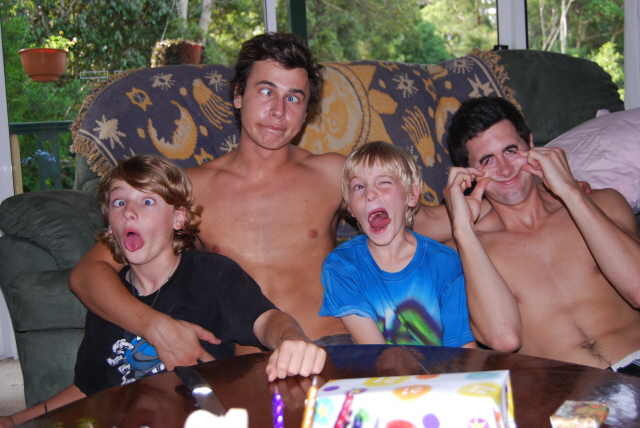 Chris was really excited as this was going to be a complete, immediate family get-together. The last time they were altogether in the one spot was a long time ago and this was quite possibly going to be one of the last. As you are all aware getting everyone together in one spot at the same time is a real feat, especially as the boys are older now and doing their own thing. Nic has had a big year, turning 21 and just completing his teaching degree. We had a lovely lunch and stayed the night, bunking down on the lounge room floor. Next morning it was back down the mountain, through Brisbane to drop Chris's mum off and up to the Sunshine Coast for an overnighter at my mother's before heading off bright and early to Bundaberg. We arrived just on lunch and started the big job of uncovering, cleaning and restocking the caravan. Harry wouldn't stop saying, 'I love my caravan'. I think he is a bit over living under canvas at the moment. 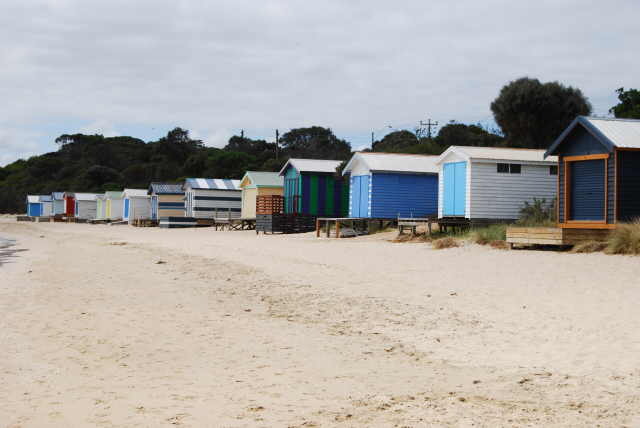 Unfortunately I spent most of the week down at our beach rental as they were having a few problems with the pool and the sewerage system, which left poor Chris doing all the unpacking and repacking. 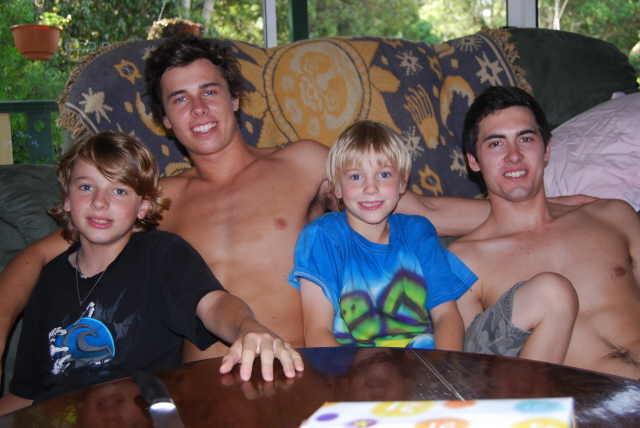 Next stop is to head down to the Sunshine Coast for Christmas for a month. More about that later. So that is it for November. We traveled 8,615 km from One Arm Point to Bundaberg. The main objective was to get the car repaired in Melbourne and we couldn't be happier with the outcome. Catching up with friends made on the road was the highlight, and the beautiful scenery and great time was just a bonus. Yet another sensational month in a sensational year. Until next month. I got a new stick deodorant today. The instructions said, “Remove cap and push up bottom”. I can barely walk, but whenever I fart the room smells lovely.